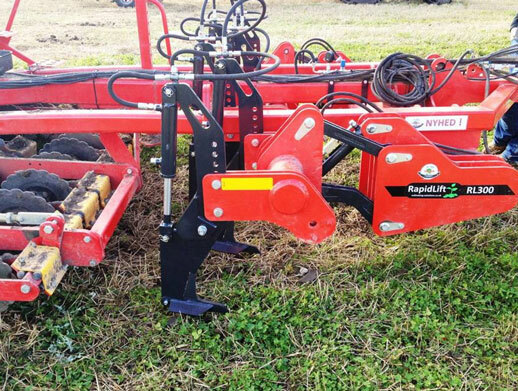 RapidLift is a hydraulically operated, low disturbance toolbar for fitting to an existing cultivator drill. RapidLift can increase the flexibility of a cultivator drill by adding soil with little or no inversion of soil layers. The RLS has been developed to create a one pass, low disturbance loosening and precision sowing system, when used in conjunction with a precision drill. Featuring a front cutting disc, low disturbance loosening legs, hydraulic press wheel (to firm the seeding zone) and rear three point linkage to accommodate a range of following drills/ precision drills. Options include a range of working widths, additional discs/row cleaners, steering axle, air brakes. The RL600 can be fitted to new and older drills to be utilised as a one pass system- particularly important in a tougher economic climate where existing farm drills can be used for an increased range of use, and cost saving from one pass cultivation and sowing. This is primarily for use in CTF systems whereby following trailed implements (up to 12 metres width) can be used in conjunction with the machine. Increasingly the machine is also being utilised in general cultivation and drilling where an integrated form of wheel track loosening is required with a range of cultivators and drills. Particularly where black grass is a problem and shallower cultivation is sought, the RLM HD allows the wheel tracks to be adequately loosened whilst the remaining width of cultivation can be carried out at a shallower depth. Independent Leg System (ILS) can be fitted to all of our cultivation equipment. Alteration of working depth, hydraulically, on the move is already standard on our machines. ILS takes this a significant step forward in allowing alteration of independent legs or groups of legs. In the instance of the RLM HD on display, ILS is configured to raise two legs independently, and these are the inner two legs. This is to suit CTF system requirements where the leg running immediately in line with the tramline can be raised from work as required to leave the tramline undisturbed while loosening the remainder of the wheeled area.